Industrial hook scale has a weight range up to 15 t. The resolution and the value of verification of the industrial hook scale is 5 kg. The industrial hook scale is verified according to M III class and can be used directly after delivery. The housing of the industrial verified hook scale has an IP 67 protection. 40 mm high digits are easy to read due to the display high contrast. The remote control is included in the delivery. 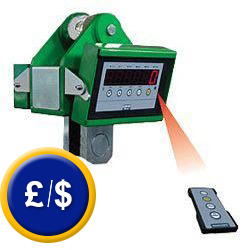 It can control the industrial hook scale at a distance up to 8 m. The main functions of the industrial hook scale are the addition of several weights, check weighing after weight limit, percentage weighing, piece counting and indication of the maximum weight. It is especially suitable for warehouses, retail, food and transport sectors, of course it can be used in other fields. 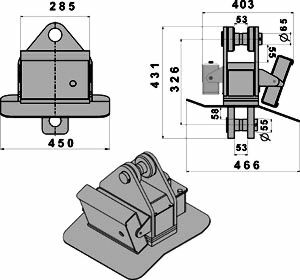 Due to the small footprint of the crane scale, it allows the usage of the lifting equipment such as overhead cranes or bridges. The industrial hook scale is sent with accumulator, charger and remote control (including battery). In addition, it is also sent verified, avoiding additional costs for verification. You will find more information about industrial hook scales (verifiable and not verifiable) if you follow the link Hook Scales. Swivel hook with safety latch hook for the hook scale PCE-MCWHU15M. Shackle for the PCE-MCWHU15M industrial hook scale.